For my English readers the title of this post reads “Merry Christmas”. Why write the title in Latvian you may ask? Has my written Latvian improved significantly? Definitely no!! Am I going mad? Quite possibly if you saw me tonight. So what leads me to this conclusion? Under the cover of darkness I performed the Latvian custom of Bluķa Vilkšana, which literally means Drag the Block. In short you have to drag/roll a tree stump around the perimeter of your land whilst chanting strange incantations and then burn the stump. As you roll the block around your land the stump is supposed to collect all the negative energies it comes across and when you burn the block the negative energies are destroyed. In true Latvian style you just have to believe. I was then persuaded to march across a field to two beehives, get down on my knees, put my ear against the hive and see if I could hear any bees buzzing. The theory is that if you can hear any bees, summer will be great. If not, start to pack up now. You can see now why I am questioning my sanity. So before I go completely mad, I would like to wish all my readers and your families a very Merry Christmas and a Happy New Year. Thank you for reading this year and I look forward to more adventures in 2016. This entry was posted in Latvia and tagged Bluķa Vilkšana, Latvian customs, Latvian traditions, Merry Christmas, Priecīgus Ziemassvētkus. Bookmark the permalink. No Christmas pudding for her tomorrow then. Have a great Christmas John, please send my best wishes to your family. I love reading your blog on life in Latvia. My father was Latvian and my mother Scottish, I am also trying to learn Latvian so I can speak to my cousins in their own language. I hope to get over to LV next year to see my family. If you’re in the Limbazi area let me know. Have a great New Year and thanks for reading. Merry Christmas to you! Thanks for all your posts this fast leaving year. Different and even strange believes are a beauty of our different nations. Merry Christmas and a Happy New Year! 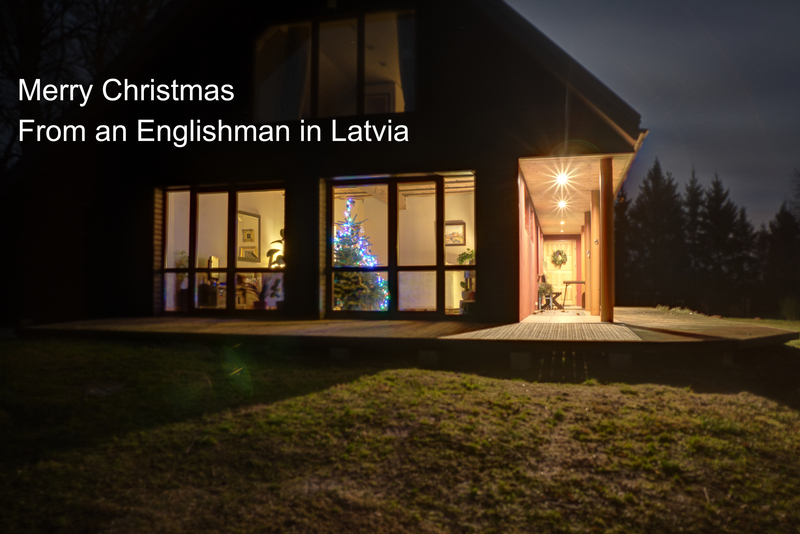 In Latvia there is a tradition that Father Christmas comes to the front door, knocks and does a runner, you might want to check if you missed him? Not sure when it must be done. I’m sure any time soon would be ok. Give you a ring as soon as our guests have gone. I met an Englishman in Latvia when I was at work last week. He asked for some seeds (I work at Thompson & Morgan). How wonderful to find another Englishman. I love reading about your life. It sounds idyllic. Can’t wait to hear what you get up to in 2016. Happy Christmas. Wendie. The log pulling thing normally is done at Winter Solstice – so around the 21st December. Until Christmas anyway. And listening to bees is an actual tradition that goes way back, when a beehive was one of the most valuable properties one could own (the only source of sugar, you know). If a beehive died during winter due to cold, draft, invaders or parasites, yor fortune was not looking too bright next year. No honey, no wax, and worse harvest (your important pollinators are gone). So listen to your bees! Their song must be strong throughout the winter, not only on Christmas Eve!